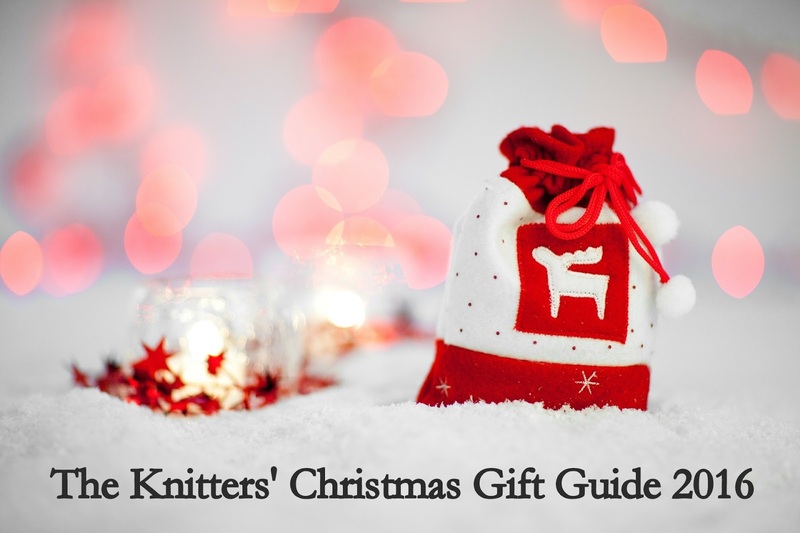 Christmas is fast approaching, and if you are a knitter who wants to add a few more things to their Christmas list, or someone who needs to buy a gift for a knitter, look no further. Here is a selection of knitting-related items that I would love to find under the Christmas tree. An animal head: I had heard about Sincerely Louise's animal heads through social media and very nearly came home from Yarndale with her unicorn head. 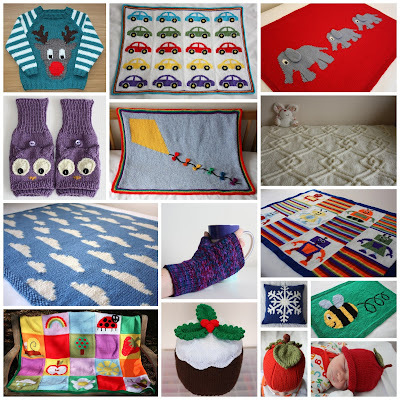 Louise has a large selection of kits in her Etsy shop. Knitted in super chunky weight yarn, these are definitely a talking point. Some woolly jewellery: Another shop I discovered while at Yarndale, Max's World sells jewellery with a yarny-theme, from acrylic necklaces that shout 'KNITTER' to earrings made from tiny balls of wool. I love them all. Funky stitch markers: Can't remember what type of decrease to do when? Yarnistry's laser cut stitch markers are there to help. Brightly, coloured and hard to ignore, these stitch markers feature common knitting abbreviations to make it easier to keep track of what you're doing. Yarnsitry also make fab needle gauges that have a slot you slide the needle tip into to work out the size, rather than having to guess which hole your needle will fit in. 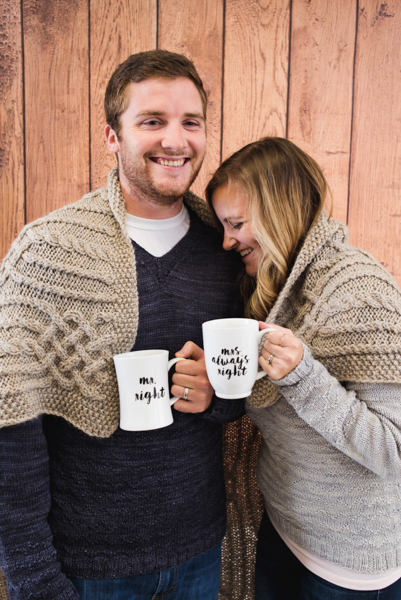 Something for the home: If you feel your love of yarn should spread beyond the yarn basket, this mug from Debbie Bliss might fit the bill - it has garter stitch on the outside and knitting instructions on the inside. Anything by Mothy and the Squid. Mothy and the Squid's yarns are hand-dyed in Glasgow and come in a huge variety of bright colours, with rainbows, stripes and mini skeins a speciality. I have never managed to look at her shop without adding something to my wishlist. Malabrigo Worsted is wonderful to work with, it's soft and comes in amazing colours. One skein would comfortably make a hat, two will make a good-sized crescent shawl (Susan Ashcroft has lots of designs that can be made in any weight with around 400 m of yarn). I am coveting the Purple Mystery. Fyberspates Vivacious 4ply; made by a British company, Fyberspates yarn has a beautiful shimmer to it, and comes in intense jewel-like colours. I have a skein that I bought a couple of years ago that I have been known to pet; it might be too beautiful to actually make into anything! One skein will make a pair of socks, or a crescent shawl; I made Helen Stewart's Spindrift shawl in the summer, and this yarn would be perfect for it. Hope this gift guide has given you a few ideas; do you have any other suggestions of must-have items that I should be adding to my list? As part of the Indie Design GAL, I have interviewed some of my favourite participating designers. Here's the second in the series, an interview with Dana Gervais. 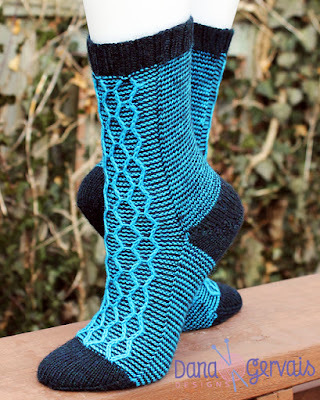 Dana Gervais is based in Ontario, Canada, and specialises in designing bright, beautiful, eye catching socks that feature an abundance of colour and texture. Many of Dana’s designs reference popular culture, such as Dr Who, Sherlock Holmes and My Little Pony; I especially love her Rainbow Dash socks, with their bright rainbow stripes. I learned to knit when I was about 7 or 8 years old from my Grandmother. She was an incredibly talented knitter and has always been my knitting inspiration. How did you getting into designing and pattern writing? Designing and pattern writing was an evolution for me. I started by heavily modifying existing patterns to suit my needs, then I started making my own designs from scratch. After many compliments and knitters asking me where they could find the pattern for something I made, I decided to start writing and publishing my designs. I started slowly at first, about 2 years ago I decided to treat it like a business. I have so many projects on the go! I have partnered up with 2 subscription services and will be designing for them next year, I have two sock designs that will be featured in a book that is scheduled to be published in May and 2 other designs that will be featured in a book that is scheduled to be published in August. I also have 5 sock designs in various stages of production. I’m hoping to release at least 2 patterns per month in 2017. What’s your favourite knitting technique? I’m a fan of any kind of colourwork that doesn’t require me to knit with 2 different yarns at the same time. I’ve just discovered Roositud and I love it! It’s also known as Estonian inlay and it’s a knitting technique that allows you to embroider on the surface of the fabric as you knit it while only knitting with one colour of yarn. I have a couple of designs in the works that use this technique. 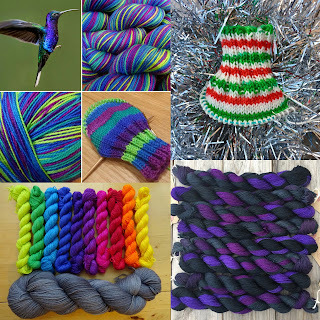 What knitting techniques would you like to try in 2017? I have a few types of heels that I’m eager to try and maybe some unique gusset construction. I’m lucky because I’m on the Pinterest team for the GAL, so I get a sneak peak at some of the designers and the patterns that will be featured. I’ve favourited some designs by Jane Richmond, Catherine Knutsson, Ambah O’Brien, Andrea Rangel, Virginia Sattler-Reimer – I feel very honoured and humbled to be in such talented company. Do you knit Christmas gifts? What are your favourite gift knits? I don’t usually knit Christmas gifts because the pressure of the deadline takes the fun out of it for me. Also, if I knit a Christmas gift for one person I feel obligated to knit for everyone. I do love to give the gift of knitting; I just prefer to do it for no reason and throughout the year instead of on one day. I often gift people socks (big surprise! ), hats, mitts, shawls, cowls, dishcloths, and scarves. A couple of week's ago the weather suddenly turned cold. As a knitter, my cupboard is well-stocked with woolly hats, gloves and scarves, but as soon as the cold snap hit I realised a large gap in my winter wardrobe: I shawl that goes with any of my coats! Before I had children, I had coats in several colours, mostly cosy woollen coats, with a waterproof for cycling and damp spring days. And since I've had children my coat wardrobe has been reduced to a ski jacket and a waterproof, both purple, and a smarter jacket which is black, but only appropriate when the weather is rather warmer. When I looked in the cupboard to get a scarf out I discovered that all my current scarves are blue. My solution to my mismatched scarf problem was an obvious one: knit a new scarf. So a couple of weeks ago I spent the morning wandering round my house with a skein of purple chunky weight yarn draped round my neck. The yarn was Artesano British Wool (long since discontinued), a chunky weight yarn in a solid purple that was just the right colour, but I was a little concerned it might not be soft enough to wear around my neck. After an hour of having the yarn around my neck, with no itching, I decided that the yarn would be great for a big, chunky shawl to get me through the colder months. The next step was to hunt Ravelry for a chunky weight shawl pattern, and I came up with two likely contenders: Offhand Lace by Caitlin ffrench and Maya's shawl by Justyna Lorkowska. Both were what I was looking for: a straightforward, quick knit that I could have knitted before the weather got any colder. I cast on Offhand Lace, and made several mistakes in the first few rows. I have no idea why (possibly the stinking cold I had at the time), but I just couldn't follow the pattern, so gave up and cast on Maya's shawl instead, with much more successful results. 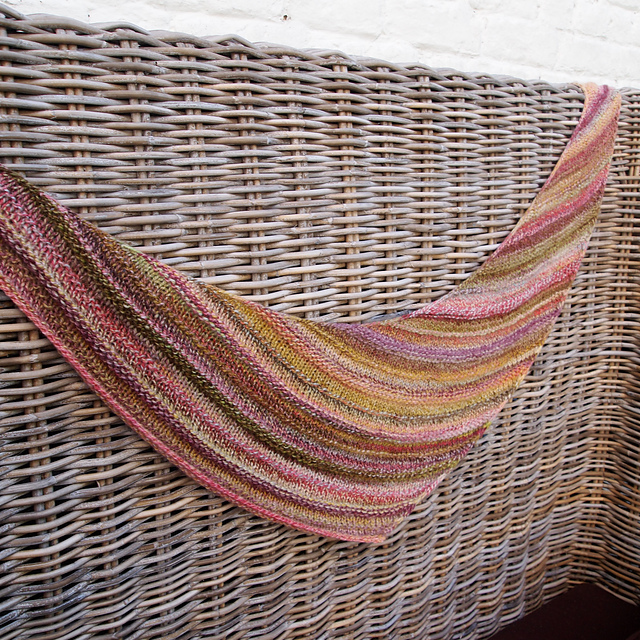 The body of Maya's shawl is a simple stocking stitch triangular, so I worked away on the shawl happily on the train to London, and at various points over that weekend. Several Ravelry projects had noted that the shawl came it smaller than they'd like, so I increased until I had 161 sts before starting the lace. The lace border went well at first, with the leaves being just challenging enough to be interesting to knit, while not being too slow. I did struggle with the simple lace border though, for some reason I find I am prone to messing up simple stitch patterns that involve a lot of repetition, and that was certainly the case here, with the seven rows of simple lace taking me several sittings. The pattern suggested going up a couple of needle sizes for the cast off, but I was being lazy and just did Jeny's surprisingly stretchy bind off as it saved going to hunt for another set of needles. I then darned in the ends and admired my new shawl. Before blocking the shawl, I wrapped it round my neck bandana-style, which is how I wear shawls, and immediately had a panic about it not being big enough. I always do this with shawls; I pay little attention to gauge or finished dimensions (though I do often hold the centre of the shawl at my chin and see if half the shalw is about the same length as my arm - if it is, then the shawl should be a good length for wrapping), and am then concerned that the shawl will be too small. Rather than dwell on sizing issues, I put the shawl in the washing machine on a hand wash cycle and went out for the day. When I got in later in the day, I pulled the shawl out of the washing machine and realised there had been no need to worry, the shawl is huge! I pinned it out to block and the span is over two metres. And here it is, my finished shawl. The colour is perfect, and it definitely goes with all my outerwear, I just hope the weather is cold enough that I actually get to wear it this winter. As part of the Indie Design GAL, I decided it would be nice to learn a bit more about some of the designers taking part, so over the course of the GAL, I will be posting interviews with some of my favourite designers. First up, we have Susan Ashcroft. 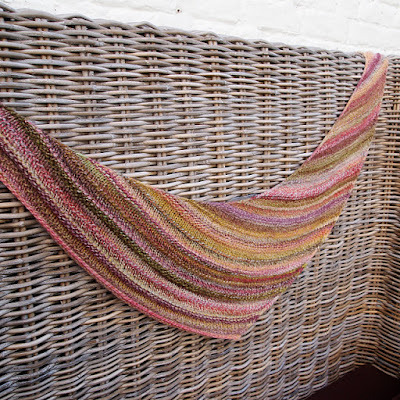 Susan Ashcroft is a well-established designer, having designed patterns for over five years (you may have seen her TGV shawl, Quaker Yarn Stretcher and Hogwart's Express shawl, which have been popular on Ravelry for years). Her approach is often mathematical, using a percentage system to design shawls that can be knitted in any yarn weight and at any gauge, with the aim of making the most of the yarn you have; last Christmas I knitted her Love Train shawl in some beautiful worsted weight yarn and it is now my most worn hand-knitted item. Susan's knits are simple and relaxed, and let the yarn do the talking; her blog is also an excellent source of tutorials and knitting tips and tricks. Not until I was about 13 - I taught myself from a book I got from the library. I’ve been modifying patterns as long as I’ve been knitting - with TGV I came up with a slightly different construction so I thought share it and it all took off from there. A collection inspired by my recent trip to Murano. Mosaic knitting because it’s such an easy way to get colour effects. Often a specific yarn is my starting point and I try to find what will work best for that yarn to “do right by the yarn”. I give knitted items to friends/family throughout the year. If you come to dinner at my house, you’ll probably go home with a knitted item, so usually people get something different at Christmas. But when I do make presents I tend to make smaller items like hats and gloves (I never have any of those “in stock”; they always seem to get adopted as soon as they’re finished). Today is Thanksgiving in the US, traditionally a celebration of harvest, it's now (at least in its portrayal in films and television) a celebration of everything you can be thankful for. Here in the UK we don't have such an event, but I feel that it's important to stop once in a while and take note of the things that we are thankful for. 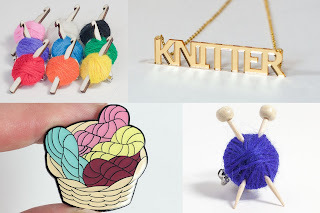 So here are five (knitty) things that I am thankful for. Through knitting I have found a wonderful community of very generous people, including some of my very best friends in real life, as well as connections across the globe. Since I learnt to knit socks I have always had knitting in my handbag. Socks projects are portable, can be knitted anywhere, and can be knitted in colourways too crazy to be considered for an item of clothing that is worn more openly. I also wear all my handmade socks, while other knitted items have been known to hide at the back of the wardrobe. I really do love knitting socks! When I'm feeling wound up after a long day, knitting calms me down and helps me to relax, which, let's face it, is probably beneficial to the people around me as well. It's November, and every morning on the school run I am reminded of quite how cold it can get in the UK. As a knitter, cold weather is an excellent excuse to show off all the winter woollies what we've been stockpiling since the spring. Yes, on cold days I am pretty smug about my handknitted socks hidden inside my boots! Happy Thanksgiving to those who are celebrating today and this weekend. And to everyone else, what do you have to be thankful for today? Today's knitting (socks) with my favourite project bag and the book that inspired it. I only realised today that the book featured knitting! The GAL starts with a sale. Every designer participating in the event (the full list can be found here) is offering 25% off a selection of their designers using the code giftalong2016. 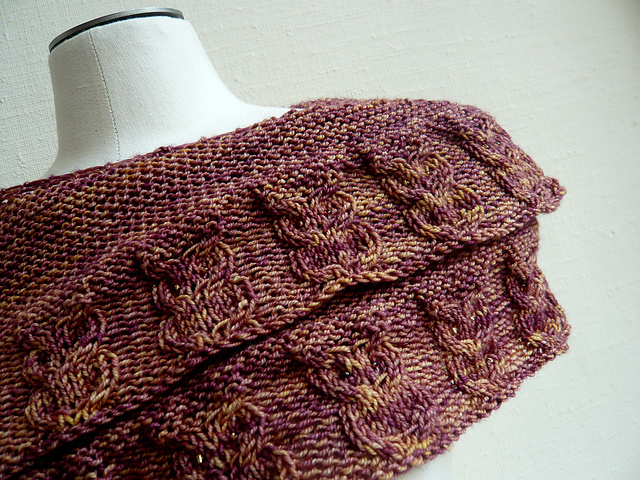 Simply add the patterns you want to you Ravelry cart, add the code and get a bargain! To see which patterns a designer has included, head to their designer profile and look for the bundle labelled Gift-A-Long 2016, this bundle will feature all the patterns the designer has chosen to include in the sale (here's my sale bundle as an example). Do note that you will have to checkout separately for each designer you wish to buy from. The sale lasts until 23.59 (EST) on Thursday 30th November 2016. The second portion of the GAL is a massive knit and crochet along. Any design by a participating designer is eligible for inclusion in the craft along, just head to the Ravelry group* and get crafting. 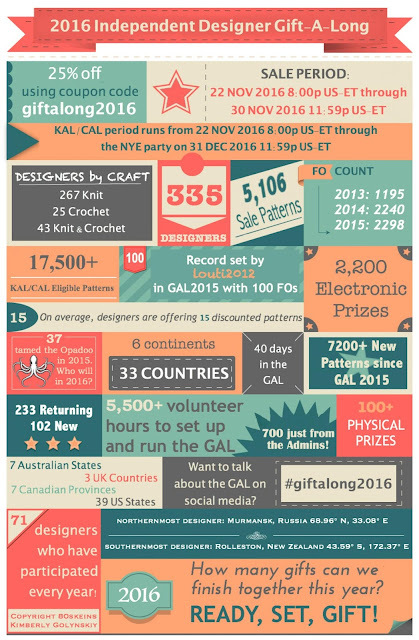 If you finish an item before the end of the GAL (23.59 EST, Saturday 31st December 2016), post it to the finished objects thread for the appropriate category and at the end of the GAL, you could win a prize (there are some great prizes on offer*). Part three of the GAL is the quizzes. Throughout the GAL, there will be several fast-moving quiz threads, with lots of opportunities for winning free patterns from the designers taking part in the GAL. The quizzes are a lot of fun, with all the answers relating in some way to the designers or patterns involved in the GAL. This year the event is huge, with 335 designers taking part, 5106 patterns included in the sale, more than 100 physical prizes and 2200 electronic prizes. So head to the Ravelry group* and join in. I am one of the participating designers in the GAL. All the patterns in this bundle are in the sale, and any of my paid for patterns can be knitted as part of the knit and crochet along portion of the event. *Note that you will have to signed in to Ravelry for these links to work. Joining Ravelry is free and Ravelry is an excellent resource for knitters and crocheters. A few weeks ago I posted a progress shot for my Antler cardigan, and it was going well. I had very nearly a whole sleeve and was looking forward to speeding through the whole cardigan as fast as I could. And then I stopped, and then I thought. In the summer I wear a lot of cardigans, and they're all lovely, but they're all lightweight, shop-purchased cardigans (mostly from Debenhams and H&M) that I throw on over little tops when it's a bit cool for bare shoulders. And in the winter, I throw on heavier weight jumpers, nothing too crazy, but a DK or aran weight jumper is always welcome. The Antler cardigan is going to fall somewhere between the two camps: it's a cardigan, perfect for summer, but too heavy to wear in the summer months, and it's the perfect weight for winter, but I never wear cardigans in the winter as I find them a little draughty. I'd also been having doubts about the fit. I had gone for the size closest to my chest size, which had 1 inch of negative ease. But having worn my winter jumpers in the past couple of weeks, I realised that I like my winter garments to have a bit of positive ease, so the cardigan is going to be a bit small. And even while knitting the sleeve I was questioning the rate of increase in the sleeves - every 6 rows is great on a baby-sized sweater, but I kept thinking it was a little fast for an adult cardigan (and yet still I carried on to the end of the sleeve; one day I will learn). And so my conclusion is to rip it out and start again. A size bigger, with slower sleeve increases (every 8 or 10 rounds, I'm still undecided on that one), and I might try and convert the body to a jumper (which no one in the first 20 pages of projects on Ravelry has tried; how hard can it be?!). And then I think it will be a garment I love. But for now it can sit on the naughty step for a bit; selfish knitting can wait until after Christmas. Yesterday I told you about my slow-growing sock yarn blanket, and today I'm going to tell you about my DIY yarn advent calendar, which should help the blanket grow over December, and give me a little much-needed time out during what can be a rather busy month. I have lots of mini skeins stashed all over the place, so at the weekend I brought them all together and chose 24 to make into an advent calendar. The choice was fairly arbitrary as I'm going to make sure I have at least a couple of positions in the advent calendar open at any particular time to give me a few options on where to put the yarn for a given day. I'm sure it'll all fit together somehow! I also purchased some chocolates for the calendar - chocolate coins and Malteser reindeer, both festive favourites of mine - some pink and white striped paper bags (5 x 7 inches, readily available on eBay) and some festive number stickers from Hobbycraft. Putting the calendar together was simple: put a skein in each bag until the pile of skeins was all gone, add some chocolates to each bag, then stick the number stickers on the bags, sealing the bags in the process. The bags were all then glamorously thrown in a carrier bag and hidden away until the end of November (I might upgrade them to a Santa sack at the end of the month, or even hang them in the living room on a washing line for all to see). I'm not totally certain I will keep up with the advent calendar - it's been a long time since an advent calendar held my interest beyond about December 12th - especially as I also have the Paintbox yarns advent calendar to work through in December, but I will try my hardest to keep up! Last year I started knitting socks, and every time I finished a pair, I added the spare yarn to a little bag, which rapidly had to be upgraded to a bigger bag, which was stashed in a cupboard for later use. I didn't think about the bag of leftovers very much. I am someone who likes to make projects with very organised colour selections, often with large quantities of a few carefully selected colours, so scrappy socks didn't appeal, nor did knitting and stuffing huge numbers of hexipuffs to make into a quilt. And then I joined Instagram and every few days someone would post a photo of their sock yarn blanket project. Apparently the idea stuck, and in January, I started browsing the internet for sock yarn blankets, settling on Tikki's mitred square pattern. The pattern can be worked across any number of stitches, and I had decided that I wanted to use as close as possible to 5 g of yarn per square, so cast on 2 stitches in my favourite sock yarn (Twilight Rainbow by Cuddlebums, on Donegal sock) and worked from the corner, increasing rather than decreasing at the centre until I had used just under 5 g of yarn; there were 42 stitches on the final row, which I cast off, then I picked up and cast on the 42 stitches for the next square. The project is not a quick one. Squares are added erratically, often five will be added over two days, then none for a month, and at the time of writing, the blanket has 57 squares. I do love working on the blanket though. It's different to everything else I knit, and it gives me a chance to play with different colours of yarn and see how one shade affects another. The one possible drawback of knitting the blanket is that it gives me a reason to buy mini skeins, which I hadn't considered buying before I started the blanket as I had no use for them, and they have a habit of accumulating! So this year, I have made myself a yarny advent calendar, featuring a mini skein to be knitted into the blanket every day. I'll tell you more about that tomorrow. I do not usually write about politics on this blog; there are plenty of other writers on the internet and elsewhere who can write about it much more eloquently. But this morning, when I woke up to the news that Donald Trump would be the next US president, my heart sank. Coming a few months after the UK voted to leave the EU, I don't like the idea of both the US and UK pulling up their drawbridges, in both cases because of campaigns that were driven by fear and hatred. So today I am living by the motto 'Hope, not hate', and have seen that many people are doing the same, with my Facebook and Instagram feeds full of acts of kindness. 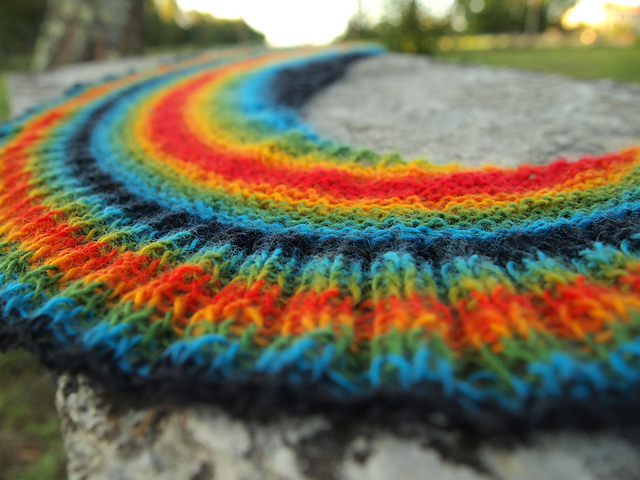 I have started crocheting a rainbow ripple blanket to donate to charity (I will be sending it to Knit for Peace, who are happy to find worthy homes for any item you wish to knit or crochet, from blankets for premature babies, to hats for refugees), because there are people in need all around the world who are more than just pawns in the game of politics, and I feel that with the current course that politics is following, the number of people in need is only set to increase. So today, and for the future, share a smile, help where you can, and remember, 'hope, not hate'. This weekend I went to London to catch up with my siblings, an event that doesn't happen very often as we are rather spread out across the country. I'd had the date in the calendar for a couple of months, but hadn't made any fixed plans, so when an email came through from Love Knitting inviting me to the launch of their blogger ambassador programme, The Flock, I jumped at the chance - I would be in London anyway, so it would be rude not to! The event started at 17.30, at Love Knitting's very shiny new office. It's in Holborn, not an area I know well, so I allowed plenty of time to find the building, and ended up arriving a few minutes early and being the first one there. I wasn't totally sure what to expect, the invite had said there would be nibbles, networking and a couple of presentations, and I was a little nervous when I arrived. I needn't have worried though, there was plenty to do, and everyone there was happy to talk about yarn, knitting and crochet all day! There was a pom pom making station, and I duly added a neon pink and yellow pom pom to a cardboard sheep (whilst chatting to Justyna Lokowska, a huge knitting name, about her pattern, Maya's scarf, which I am currently knitting); I chatted to Karie Westermann, who knew who I was, which totally made my day; there was a table of delicious and very cute snack food; I met lots of people, including a few familiar faces and lots I hadn't come across before (and a few really big names that I was too shy to talk to), who were all as enthusiastic as me about all things knitting; and we got to squish a lot of yarn: every table in the room had baskets of yarn on them, which we were allowed to play with, stroke, cast on, take home; obviously all there for promotional purposes, but it was paradise. This was even brighter in real life! There were indeed some talks about Love Knitting and the rest of the Love Crafts family, as promised, and a little quiz, which had prizes: I came away with a Paintbox yarns advent calendar, containing lots of little balls of yarn that will become some form of (as yet undecided) bunting over the course of December. The whole event was only two and a half hours long, and the time whizzed by. When we left, we were each given a goody bag containing some more yarn (I also had some pom pom makers in mine; I think everyone got something different), which my sister and I pawed at on the train back to hers. Huge thanks to Love Crafts for hosting the event; and if you ever get a chance to go and visit their office, go, it really is a little yarny paradise! The clocks went back last week, and the nights are definitely drawing in, so now is the perfect time to cast on a cosy cabled blanket. My latest design, Winter garden gate throw, is just the thing. The throw is inspired by the twisted lines and spirals of wrought iron ornamental work, which are replicated in intricate cables. The throw measures 131 x 141 cm (51¾ x 55½ in) and can be used ornamentally but is also an excellent size for snuggling in on a sofa. 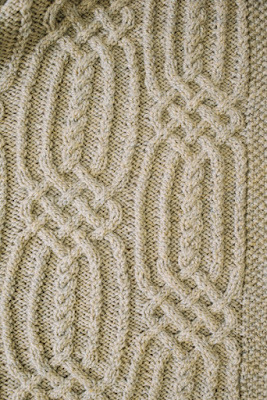 Winter garden gate throw is knitted in one piece with a moss stitch border surrounding the cabled panel. 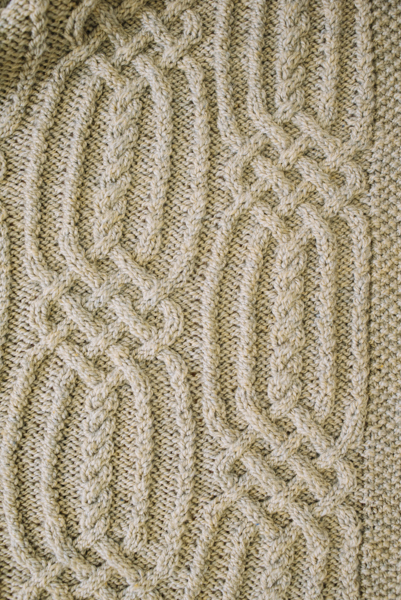 The cable work is intricate, but as the design is knitted in chunky weight yarn you can start to see the pattern develop really quickly; I strongly recommend learning how to cable without a needle for this design, as there are cables every few stitches, and losing the cable needle would be pretty frustrating! 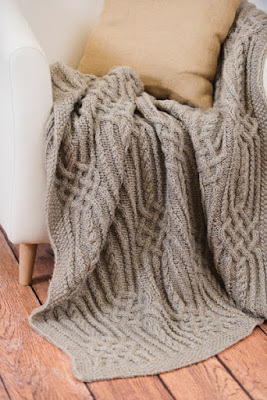 The throw is knitted in King Cole New Magnum Chunky, which is one of my favourite chunky yarns: the yarn is soft and warm, but also hard wearing, easy care and economical. Winter garden gate throw is available exclusively in the December 2016 edition of I Like Knitting magazine, a subscription-only e-zine. 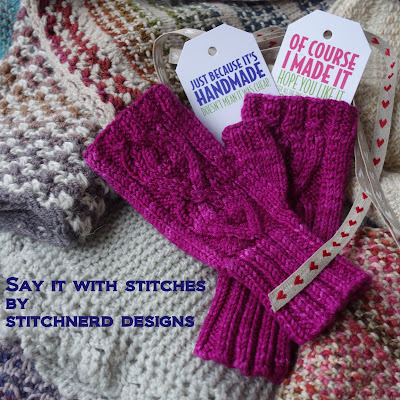 For more detials about how to access the pattern, head to their website. 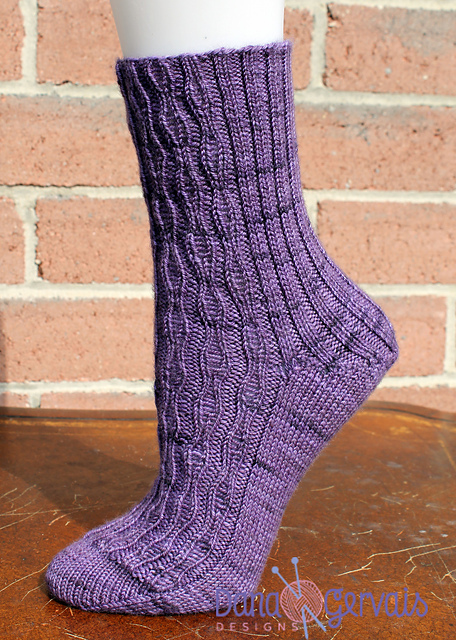 Thanks to King Cole for providing yarn support for this design.